Click on item #50 in the shopping cart to buy this book. Comes with a CDROM with exclusive data about the Mercury Spacecraft and Curt's search. 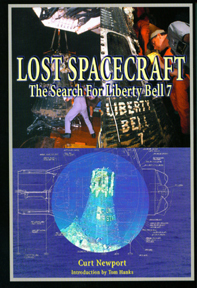 Lost Spacecraft - the Search for Liberty Bell 7 describes the exploration of two unique and dangerous environments - space and underwater - and how the paths of two men, one living and one dead, crossed in the recovery of the Liberty Bell 7 spacecraft. "Lost Spacecraft" focuses on two periods, one beginning in 1959, the other in 1985, interweaving the stories of Project Mercury, Gus Grissom and his ill-fated Mercury flight, on-going developments in deep ocean exploration, and Curt Newport's 14-year obsession to raise the sunken space-age Titanic from the depths of the Atlantic Ocean. Also told is how Newport's team, against staggering odds, managed to find the phone-booth sized space vehicle during his harrowing 1999 expedition, only to see their recovery vehicle and Liberty Bell 7 ripped from their grasp by the forces of nature. Newport later recovered Liberty Bell 7 during what remains the deepest commerical salvage operation in history, reutrning Grissom's craft to Cape Canaveral, Florida thirty eight years to the day after Grissom blasted off his tiny launch pad. However, the prevalent theme running through "Lost Spacecraft" is how simple luck almost rivals technical ability when exploring any deadly environment, whether it be the silent void of low-Earth orbit or the crushing cold of the abyss.